Neighbors Foundation of Grand Island, NY Inc.
BOARD of DIRECTORS: Beth Boron, Linda Clark, Ann Dahl, Marlene Deuble, Nancy Hayes, Dave Khreis, Kathleen Lechner, Angelo Palamuso, Jan Sheehan, Larry Slovick, Linda Tufillaro. Grand Island residents please call 773-1452 or 773-7476. The Neighbors Foundation of Grand Island is very happy to have received continuing support, beyond that originally reported, from the community thru Internet (PayPal) donations and good response at the Pancake Breakfast at Elldens (River Oaks). We proudly list these Additional Donors on the Neighbors Foundation section of the inner pages of IsledeGrande. our thanks to the entire community for your support, as we continue to help those facing temporary economic difficulties. The Neighbors Foundation of Grand Island was happy to have brightened somewhat the Holiday Season for 50 families on the Island. However, we did NOT do it ourselves! Many of you from Grand Island helped with financial, food, and gift contributions, so that the Foundation could provide food baskets, turkeys, hams, gifts for children involved, and other help for those families. Many of you helped: big food collection by students from all schools, hard work by School System Maintenance Dept. bringing it to K of C Hall, then DECA and Interact sorting that food for us. Many local organizations: the K of C with use of their Hall for distribution, River Oaks Golf Club (Elldens), others made donations to our "Share Your Happiness" fund drive or held events that raised money, collected food. To acknowledge the help we have received, the Neighbors Foundation has placed a listing of all our donors and workers in the Neighbors Foundation segment of the IsledeGrande.com web site. The Foundation, with donations and work of so many in those lists, was able to help your Island neighbors in temporary financial distress. Thanks to all the donors and helpers listed in that summary - you made the 2018 Holiday Season a bit happier for your Island neighbors. The River Oaks Golf Club and Ellden's has generously donated the entire cost of a PANCAKE BREAKFAST event on Sunday, January 6, 2019 from 9:00 a.m. - 1:00 p.m., to support the Neighbors Foundation. Your donation of $5 (or more) gives each: pancakes, sausage, orange juice and coffee, with all proceeds going to help the Neighbors Foundation provide Holiday Baskets of food, turkey and gift cards for any children involved, to over 50 Island families that are in temporary need this Holiday season. At left: President David Conboy and Director Emeritus Henry Kammerer with volunteers. Click photo for larger view. Pick-up full of turkeys and hams. This is just the soup collection. After a very successful "Share Your Happiness" campaign, The Neighbors Foundation, with help from Grand Island middle and high school students,distributed the donations for 50 Grand Island families on Thursday, December 13th. For over 40 years, The Neighbors Foundation has helped out those in need around the holidays, with gift cards hams, turkeys and non-perishable food items. New President David Conboy spoke of his gratitude for all the donations and help from the community and schools and the foundation is always looking for new members to bring new energy and ideas to the group. For more information go to www.gineighbors.org. Donations are accepted at St. Stephens Church and DeSignet Jewelry, 1871 Whitehaven, year round. 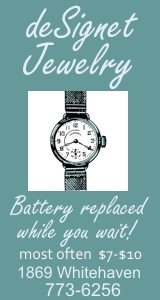 - DeSignet Jewelry, 1869 Whitehaven Road, will have a donation drop off box through mid December. Help wrap up shoe boxes of toiletries for teen recipients of the holiday food boxes on Saturday, December 8th at 10:00 a.m. in the St Stephen's Church basement. If you have children in the GI schools, they will all be collecting needed items around Thanksgiving. Each school has a different collection system, so watch the newsletters for specifics. Financial donations are much appreciated, especially at this time when the holiday boxes are put together and meat, grocery gift cards, and toiletries need to be purchased. (See Share Your Happiness Campaign article below.) At the last meeting they emphasized what they need the most is volunteers. Many key volunteers are retiring and the group needs more members to keep their wonderful services running. The next meeting is on Monday, December 3rd at the Nike Base. 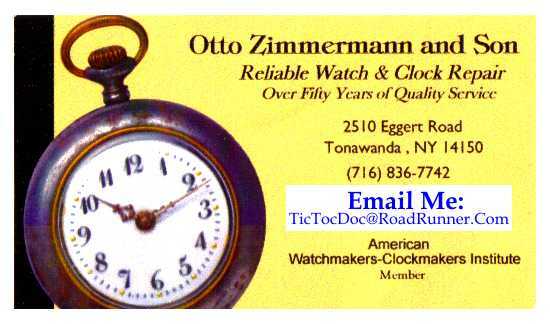 Contact Lynn Henschel at hensch98@roadrunner.com with any inquires about the group or how to help. It is that time of the year when we look to our friends and generous supporters of the Neighbors Foundation in our planning for the Annual Holiday Distribution to the less fortunate family members on Grand Island. For over 40 years, we have provided food gift baskets and gift card donations to families in temporary need, all made possible from donations from individuals, groups and organizations. Could you 'Share Your Happiness' by making a donation to the Foundation at P. O. Box 155 (or thru Paypal at www.gineighbors.org)? Financial contributions will help 'fill out' the food contributions that the Grand Island schools are collecting for us. The Neighbors Foundation will distribute gift cards to our families of infants - 13 year old children, so those parents may use gift cards to purchase gifts for them. As such, we would appreciate and graciously accept (for our Holiday Distribution) gift cards for either TARGET or TOPS. We hope generous supporters will consider donating gift cards, or providing financial donations that can be used to provide the cards we will distribute to our families in need. We will continue to provide toiletries gifts for teens, so gifts of toiletries will be useful to fill boxes for those teens. Thank you for your consideration of participating in our fund raising and gift card campaign. Last year we provided food baskets, toiletries and gift cards for over 60 families with close to 150 children. Your donation to the Neighbors Foundation helps to make a difference in the lives of these families and their children during this holiday season. The River Oaks Golf Club and Ellden's has generously donated the entire cost of a PANCAKE BREAKFAST event on Sunday, January 7th from 9:00 a.m. - 1:00 p.m., to support the Neighbors Foundation. Your donation of $5 (or more) gives each: pancakes, sausage, orange juice and coffee, with all proceeds going to help the Neighbors Foundation provide Holiday Baskets of food, turkey and gift cards for any children involved, to 54 Island families that are in temporary need this Holiday season. Then - in public places or home, HELP THE BILLS TROUNCE JAX! The Neighbors Foundation of Grand Island would like to thank the hundreds of individuals and organizations who contributed to our successful 2017 Holiday Distribution. Over 52 of your neighbors were helped with food baskets and, where appropriate, gift cards for their children. The Foundation is a small, all-volunteer organization; we don�t do this �ourselves�, we depend on the community to recognize the need around all of us, and to respond so generously. Even in pleasant, suburban Grand Island, there are needs, and you have helped. Thanks to all of you! See Donor List. The Neighbors Foundation of Grand Island was happy to have brightened somewhat the Holiday Season for 57 families on the Island. However, we did NOT do it ourselves! So many from Grand Island, others near or far, helped with financial, food, and gift contributions. Thus the Foundation provided food baskets, turkeys, hams, gifts for children involved, and other help for those families. So many helped: food by students from all schools, then from DECA and Interact sorting that food for us. Many local organizations: the K of C with use of their Hall for distribution, River Oaks Golf Club (Eldens), others, made donations to our 'Share Your Happiness' fund drive or held events that raised money or collected additional food. To acknowledge in some small way the help we have received, the Neighbors Foundation has placed a listing of all our donors and workers in the Neighbors Foundation segment of the organization groups on Isle de Grande. The Foundation, with the donations and work of so many in those lists, was able to help many of your Island neighbors in temporary financial distress. Thanks to all the donors and helpers listed in that summary - you made the 2016 Holiday Season a bit happier for your Island neighbors. See list. The River Oaks Golf Club and Elden's has generously donated the entire cost of a pancake breakfast event on Sunday, December 11th from 9:00 a.m. - 1:00 p.m., to support the Neighbors Foundation. Your donation of $5 (or more) gives each: pancakes, sausage, orange juice and coffee, with all proceeds going to help the Neighbors Foundation provide Holiday Baskets of food, turkey and gift cards for any children involved, to approximately 60 Island families that are in temporary need this Holiday season. Please join us in the beautiful River Oaks Club House for a delicious, easy, Sunday breakfast during this hectic season, while you benefit the work the Neighbors Foundation does to make Grand Island a grand place for all its families. It is that time of the year when we look to our friends and generous supporters of the Neighbors Foundation in our planning for the Annual Holiday Distribution to the less fortunate family members on Grand Island. For over 40 years, we have provided food gift baskets and gift card donations to families in temporary need, all made possible from donations from individuals, groups and organizations. Could you 'Share Your Happiness' by making a donation to the Foundation at P. O. Box 155 (or thru Paypal at www.gineighbors.org)? Financial contributions will help 'fill out' the food contributions that the Grand Island schools are collecting for us. The Neighbors Foundation will distribute gift cards to our families of infants � 13 year old children, so those parents may use gift cards to purchase gifts for them. As such, we would appreciate and graciously accept (for our Holiday Distribution) gift cards for either TARGET or TOPS. President Henry Kammerer with VCMS students. 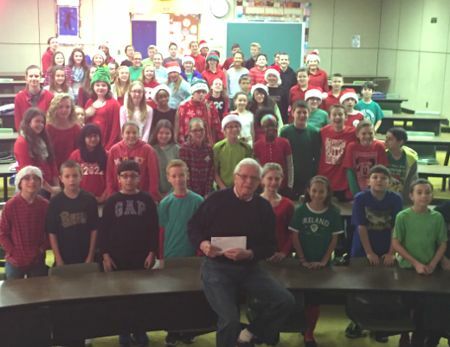 On December 23, 2015, students at Veronica Connor Middle school presented the Neighbor's Foundation of Grand Island with $650.00 in donations. These donations were raised through the annual "Give Change to Make a Change" fundraiser. Top classes, in the photo include Mrs. Slaght's mod 2 and mod 11 Honor's Math classes, and Ms. Poole's mod 1 6th grade class. For their efforts, they were rewarded a "Donut Party". The Neighbors Foundation of Grand Island is proud to have had your help in brightening somewhat the Holiday Season for 62 families on the Island. We must admit that we join thoughtful folks, sad there are those families (and unfortunately, probably a number more) in distress in our area - we so want to believe that a rising economy helps all. Be proud that your financial, food, and gift contributions helped the Foundation provide food baskets, turkeys and/or hams, gifts for children involved, and other help for those families. Seedonators list. So many helped: food by students from all schools, then from DECA and Student Council sorting that food for us. 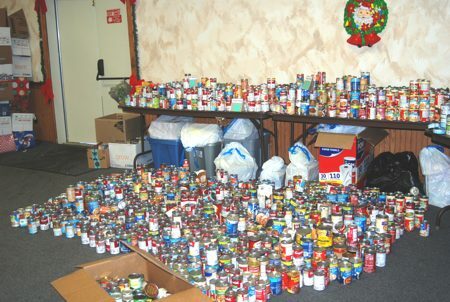 Many local organizations, particularly River Oaks Golf Club (Ellden's), made donations or held events that raised money or collected additional food. The Officers and Directors of the Foundation keep our work low-key and certainly do not 'advertise' our help to distressed families. We show the names of our hard-working Officers and Directors after listing of all our donors in the Neighbors Foundation segment of the organization groups on Isle de Grande. Those people, plus other Advisors, help convert your generous donations into useful help for your Island neighbors in temporary financial distress. Thanks to all the donors and helpers listed in that summary who made the 2015 Holiday Season a bit happier for your Island neighbors. With the switch to gift cards for many children, we will need only a modest amount of toys and gifts to distribute to the very young. We hope generous supporters will consider donating gift cards, or providing financial donations that can be used to provide the cards we will distribute to our families in need. We have found it quite successful to provide toiletries gifts for teens � yes, we know they wash their hair every day! That portion of our Holiday Distribution remains unchanged, so gifts of toiletries will be useful to fill boxes for those teens. Thank you for your consideration of participating in our fund raising and gift card campaign. Last year we provided gifts for over 60 families with close to 150 children. Your donation to us helps to make a difference in the lives of these families and their children during this holiday season. The Neighbors Foundation of Grand Island would like to thank the hundreds of individuals and organizations who contributed to make our 2014 Holiday Distribution so successful. Over 53 of your neighbors were helped with food baskets and, where appropriate, gift cards or toys, for their children. The Foundation is a small, all-volunteer organization; we don't do this 'ourselves', we depend on the community to recognize the need around all of us, and to respond so generously. Even in beautiful, suburban Grand Island, there are needs, and you have helped. Thanks to all of you! On Sunday, Dec. 21, the River Oaks Clubhouse (Elden's Restaurant) is offering a Pancake Breakfast from 10:00 a.m. - 1:00 p.m. to support the Neighbors Foundation. A $5 donation to the Foundation gives you excellent pancakes. The staff and management of River Oaks are donating all services and supplies to make this a great fund-raiser for the Neighbors Foundation, as the Foundation prepares Holiday Baskets for over 50 families of Grand Island who are having temporary financial difficulties this year. We on the all-volunteer Neighbors Foundation staff are particularly happy to thank Tom and Diane Brady of River Oaks management for their major support of the Foundation at this Holiday Season. We welcome all Grand Islanders to enjoy this Pancake Breakfast on Dec. 21 from 10 AM to 1 PM, increasing the support of the Foundation at the same time. The Neighbors Foundation of Grand Island presented $1500 in gift cards to the Grand Island Central School District on Thursday, August 28th. 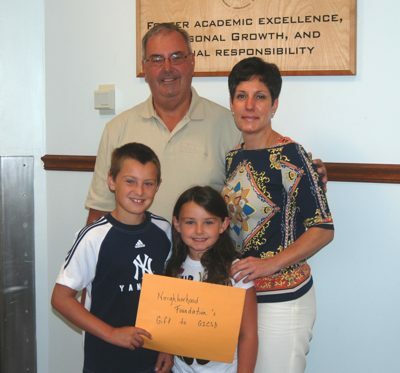 Foundation Board of Director Dennis Dahl was accompanied by grandchildren Cole and Callee Bartolotto when presenting the cards to Superintendent Teresa Lawrence. At this time of year, a family may need some help in buying supplies or clothing for their children. The Neighbors Foundation is always ready to help. The Neighbors Foundation of Grand Island would like to thank the hundreds of individuals and organizations who contributed to make our 2013 Holiday Distribution so successful. Over sixty five of your neighbors were helped with food baskets and, where appropriate, gift cards or toys, for their children. The Foundation itself is a small, all-volunteer organization; we cannot do anything �ourselves�, we depend on the community to recognize the need around us, and to respond so generously. Even in beautiful, pleasantly suburban Grand Island, there are needs, and you have helped. Thanks to all of you! List of donors. Additional donors list, added 1/15/14. 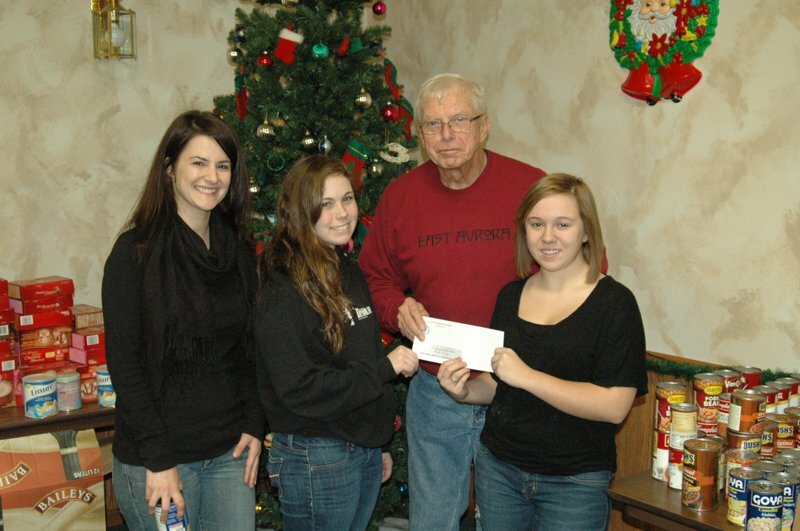 The Neighbors Foundation had their busiest year yet as they helped 68 families have a very nice holiday. For over 35 years the Neighbors Foundation have been helping those in need, especially during the holidays. The Grand Island Schools collected non-perishable items and gift cards, gifts and money was collected from the community. Each family will receive a turkey and gifts and gift cards for everyone in the family, along with canned goods. In the future, the Foundation is asking that all donated items be in the form of gift cards or cash donations, not actual gifts as in the past. The gift cards work out very well for all ages. Items may be donated at any time during the year to P. O. Box 155, Grand Island, New York 14072. It is that time of the year when the Neighbors Foundation looks to their friends and generous supporters in the planning for the Annual Holiday Distribution to the less fortunate family members on Grand Island. For the past 39 years, they have provided food pantry gift baskets and toys/gift donations to our families in need, all made possible from donations from various individuals, groups and organizations. Toys and stuffed animals are great for the young children of needy families that participate in the "Share Your Happiness" campaign. This year the Neighbors Foundation would like to provide some modest amount of store gift cards to the parents of the 7 - 13 year old children that are helped. They are accepting $5, $10, $20 and $25 cards from suggested merchants: Top's Markets, Dollar Tree, Walgreens, Rite-Aid, Target, Walmart, Toys R Us, Macy's and Kmart. Please submit your donation ASAP. Mail to: Neighbors Foundation, PO Box 155, Grand Island, NY 14072 or call foundation board President Hank Kammerer at 773-1245 for pick up. The Neighbors Foundation of Grand Island would like to thank the hundreds of individuals and organizations who contributed to make our 2012 Holiday Distribution the largest and most successful ever. Sixty six of your neighbors were helped with food baskets and, where appropriate, toys and gifts, for their children. The Foundation itself is a small, all-volunteer organization; we cannot do anything �ourselves�, we depend on the community to recognize the need around us, and to respond so generously. You recognize that even in beautiful, pleasantly suburban Grand Island, there are needs, and you have helped. The Foundation is continuing to grow and �modernize�, within the list of donors below there are several who donated via our Internet Web page! Thanks to they and all of you! The Neighbors Foundation is helping out 65 families this year with food and Christmas gifts. 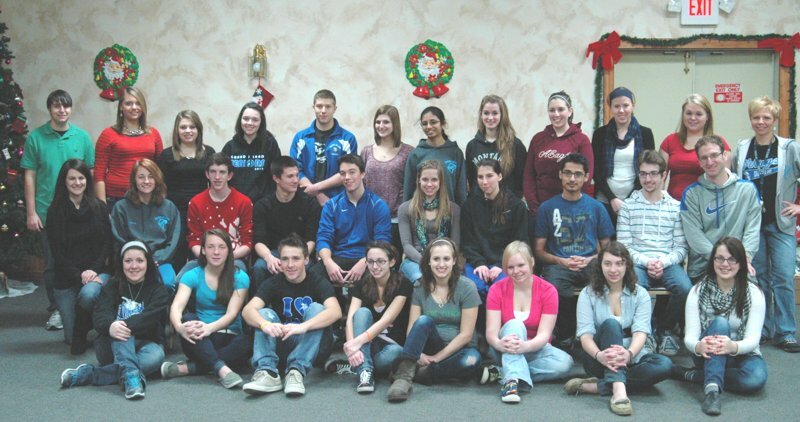 Grand Island High School students from the DECA Club, Casey's Corner and Student Council gathered on Tuesday, December 18th to distribute the non-perishables. Families will pick up their gifts and food donations that afternoon/evening. Included in the food and gift baskets were $5000 in Top's Gift Cards, $1000 in gift certificates from John's Pizza (thank you Mark Raepple) and 1000 packages of Bremner cookies (thank you Rick Karnath). Student advisors on hand to help with the distribution include Cheryl Chamberlain/High School DECA, Christine Podlucky & Bob Simpson/Student Council and Mary Jane Fonte/Middle School Deca. Neighbors helping Neighbors, this time from a fire, other times from economic distress. The Neighbors Foundation of Grand Island, Inc, is proud to step forward and join the High School, Town of Grand Island, WGRZ-TV and numerous individuals plus businesses who are helping an Island family burned out of their apartment on Novovember 5, 2012. Linda Ray and her two sons have been left homeless and with �nothing but the clothes of their backs� (literally) by the fire. With help spearheaded by Mary Friona of WGRZ, Principal Sandy Anzalone and Grand Island Town Supervisor Mary Cooke, contributions to the Neighbors Foundation, plus Foundation funds, will assist them in re-establishing their lives. We, as their neighbors, cannot bring back the pets they lost, but we can make their lives a little better by showing that we all care. The Foundation has a long-standing tradition of helping families in need on Grand Island. The Foundation also continues with its program of helping needy Island families in the 2012 Holiday Season with food and gift baskets. We ask the Grand Island community for extra support in our Holiday �Share Your Happiness� fund drive through donations to P. O. Box 155, Grand Island NY 14072 or through the �Donate Now� button on our Web Site www.gineighbors.org. The Neighbors Foundation is an all-volunteer charity with IRS 501c3 status helping Grand Island families (only) through their times of temporary need. Left: Student Council Advisor Christina Podlucky, Bree McGuire, Hank Kammerer and Council President Brittanee Ramallo. Grand Island High School students from the Deca Club, Casey's Corner and Student Council came together on Tuesday, December 20th to sort and distribute all of the food collected during the annual "Share Your Happiness" campaign. The food donations were double the collection last year and packed the Knights of Columbus where the distribution took place. Sixty families will be stopping in to pick up their goodies, up from 45 families in 2010. In addition donations were made from the GIHS girls' soccer team, Casey's Corner and from the Student Council Tree Auction. Thanks go to high school students and advisors Robert Simpson, Christina Podlucky and Cheryl Chamberlain for all their efforts. Casey�s Corner and DECA helped those in need during this holiday season by holding two different fundraising events at Grand Island High School. The yearly tradition of �Something Sweet� enables students to send a stocking full of candy to their sweetheart�s homeroom for a small donation. 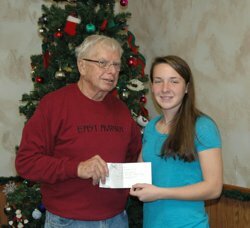 The proceeds allowed the store to present a check for $150 to The Grand Island Neighbors Foundation. In addition, an �Ugly Sweater� contest was also held and students entered by donating $1 to the Community Mission. Mrs. Chamberlain and her students collected over $60 to purchase toys and mittens and delivered them just before the holiday. DECA and Casey�s Corner students wish everyone a wonderful holiday season. Grand Islanders can be proud of all that they did this Holiday Season to help the Neighbors Foundation help 60 families having difficult times with food, toy and gift baskets. Our Grand Island school children in the public schools and in St. Stephen school came through with a tremendous outpouring of food (OK, we know you parents really provided the cans and boxes). 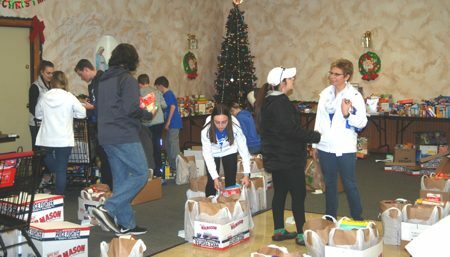 DECA, Student Council and Interact students from Grand Island High School sorted that food into 60 overflowing packages. 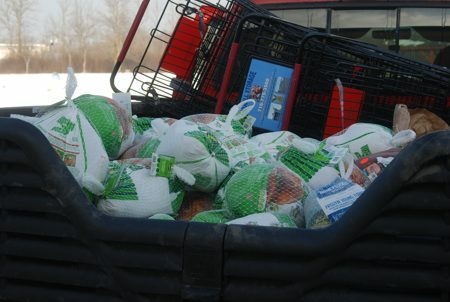 Service and community clubs, individuals, organizations and businesses provided the Neighbors Foundation with funds to add turkeys, hams, gift cards and other treats to the baskets. With the economy around us barely improving, the need was greater than it has been for several years; we know all of you are �stressed�, but you recognized the need of your neighbors. We thank everyone who helped in any way. Those who were helped cannot speak for themselves, we send their thanks to you. 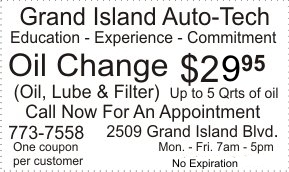 Once again, Grand Island is a grand place; may we all have an improved year in 2012. The Neighbors Foundation is continuing the tradition of helping families in need at this 2011 Holiday Season with food and gift baskets, but earnestly asks the Grand Island community for extra support in our Holiday �Share Your Happiness� fund drive through donations to P. O. Box 155, Grand Island, NY 14072. In addition, as the Grand Island Schools and other groups have non-perishable food drives, increased generosity to those drives would greatly help those in need. The Neighbors Foundation is an all-volunteer charity with IRS 501c3 status helping Grand Island families (only) through their times of temporary, emergency need with food baskets and partial payments toward rent and utility bill payments where appropriate. Neighbors Foundation Wish List. The Neighbors Foundation is starting to collect items for the "Share The Happiness" campaign that takes place every year. Trinity UMC Church is collecting teen pajama bottoms for boys and girls. The collection box is in the front hall of the "new" church, located at 2100 Whitehaven Road. The collection will take place during the month of November.